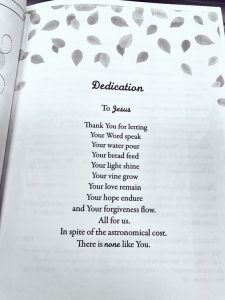 With four books and several Bible studies published, I finally feel qualified to write this post. Perhaps it’s just the experiential miles talking. The simple answer is the amazing grace of a faithful God and the incredible support of family and friends. But there’s more. It requires commitment. Sacrifice. Focus. Organization. And no small amount of blood, sweat and tears. Through trial and fire, I’ve discovered five specific ways to stay sane while meeting manuscript deadlines. There are many more, but these five help set solid boundaries. 1) Say NO to new commitments until the manuscript is turned in. New and cool opportunities will start pouring in the moment you commit to a writing deadline — trust me. It’s like when you commit to eating healthy and suddenly chocolate materializes everywhere. However, resisting the urge to add entries to your calendar is crucial to protect your writing time. 2) Take a sabbatical from voluntary, time-consuming commitments. I sing on my church’s worship team and absolutely love it. However, it requires time learning music, diligent rehearsal, run-through, and singing at both services on Sunday morning. I took a sabbatical from the worship team for the two months prior to my last manuscript deadline to shift that time toward writing. The team’s support and prayers touched me to the core. The cool thing? A few new worship leaders have stepped forward to become amazing blessings to our church. 3) Commit to writing a certain word count each day. I created a 3-month daily chart containing current commitments. It allowed me to ascertain at a glance which days/evenings could be devoted toward significant blocks of writing time. Regardless, I committed to adding 1,000 words to the manuscript each day (except Sundays). Some days I only added 500 words, but others reached over 3,500. The chart kept me on track right up to the deadline. 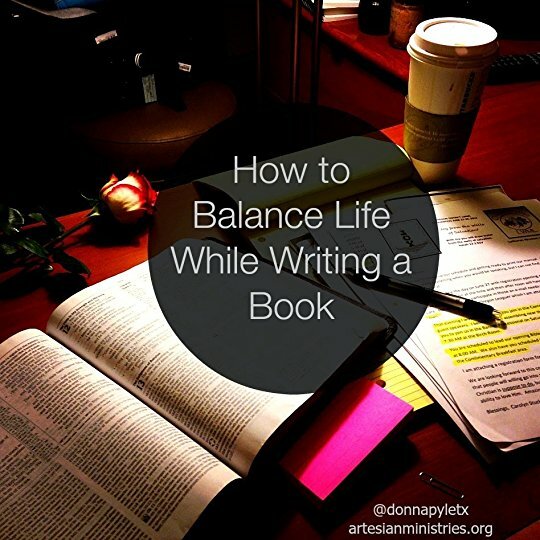 4) Sign off of social media and devote all spare time to your manuscript. If I had 30 minutes to write, I wrote! I loaded my manuscript onto a dedicated thumb drive and wrote during lunch breaks, waiting at the airport, and during flights. You’ll be surprised at how much you get done when you’re focused. I also scheduled a week of vacation from my full time job right before the deadline. I sequestered myself at home and fine-tuned the manuscript, taking time to pray often. I also took a two-month sabbatical from my blog and avoided social media for the final ten days to eliminate distraction. This one is extremely tough. Writing involves more than strolling along picturesque rivers at sunset while eating French bread washed down with wine while pondering deep thoughts that will eventually be captured on our laptop. I’m sorry to pop the idealistic bubble, but writing entails long hours of research and typing with complete focus. Headaches, backaches and stiff necks go with the territory. Explaining my deadline and commitment to family and friends included them in the process instead of shutting them out. They understood that I couldn’t go to impromptu movie nights until after the deadline. Their encouragement and prayer support kept me going during those tougher writing days (yes, they happen). I am looking forward very much to this summer, because come Fall I will buckle down, put these five items into high gear and complete my next manuscript before Thanksgiving. And remember, intentionally rest between manuscripts to re-engage in normal life, putter around the house, take a vacation, and breathe again. Rest is crucial to tackling your next project with enthusiasm instead of exhaustion. If you’re an author, what could you add to the list? If you’re an aspiring author, did you find anything surprising? Samson had an anger problem. Well, maybe he just never learned how to process anger well. In Judges 15, an incident between Samson and his father-in-law eventually escalated into battles involving nations and the slaughter of thousands of innocent people. When Samson returned home to his wife after a time away, he learned that his father-in-law (thinking Samson hated his wife) gave her to Samson’s companion. To add insult to injury, his father-in-law then offered his other daughter to Samson. In a rage, Samson declared war on the Philistines (his father-in-law’s people) by torching their grain fields and olive orchards (Judges 15:1-5). The destruction affected the Philistines both economically and religiously, because they believed in gods of harvest, among others. In retaliatory revenge, the Philistines burned Samson’s wife and father-in-law to death (Judges 15:6). Ironic. Samson vowed not to stop his rampage until he exacted revenge for his wife and father-in-law. He subsequently attacked and slaughtered many Philistines (Judges 15:7–8). The Philistines retaliated by hunting down Samson, attacking the town of Lehi on the way. Three thousand men of Judah confronted the Philistines to ask why they were coming against them. When the Philistines named Samson as the culprit, the men of Judah found Samson and handed him over (Judges 15:9–13). But Samson wasn’t finished. He picked up the jawbone of a donkey and killed one thousand men with it. One thousand men. All of this destruction and mayhem started with Samson, his father-in-law, and a goat. Why are we so bent toward revenge? What is it that makes revenge alluring? Active revenge: This kind of revenge moves aggressively toward our offenders. Perhaps a family member says something derogatory about your spouse. You immediately take offense and start telling the rest of the family about their many faults (whether secret or not). Active revenge always hurts far more people than we realize. Passive revenge: This kind of revenge deceptively looks like forgiveness. Passive revenge does not move aggressively toward the offender, but takes the form of withholding, cold shoulders, or secretly celebrating when something negative happens to them. It is forgiveness lip service, not a genuine movement toward it. Revenge tells God, “You’re in my seat.” When I choose to take revenge, I alone determine the severity of a person’s transgression, the proper method of punishment, and the time frame in which it needs to occur. Revenge inflates the ego because I alone determine that God is not moving fast enough or meting out what I believe is appropriate judgment. Consequently, I take matters into my own hands and execute judgment. Revenge means failing to entrust my wound to God’s justice. Revenge always escalates. An offense can start with something as small as the rolling of eyes at someone’s behavior in a social setting. But it doesn’t end with reciprocated rolling eyes. It always escalates. Remember Shakespeare’s Romeo and Juliet? The feud between the Capulets and the Montagues was “bred on an airy [misspoken] word.” Multiple civil brawls later, Romeo and Juliet died in their efforts to be together. Revenge always inflames and creates an inflated ego that says, “I have the right to pay back the hurt they inflicted on me.” And back and forth it goes. 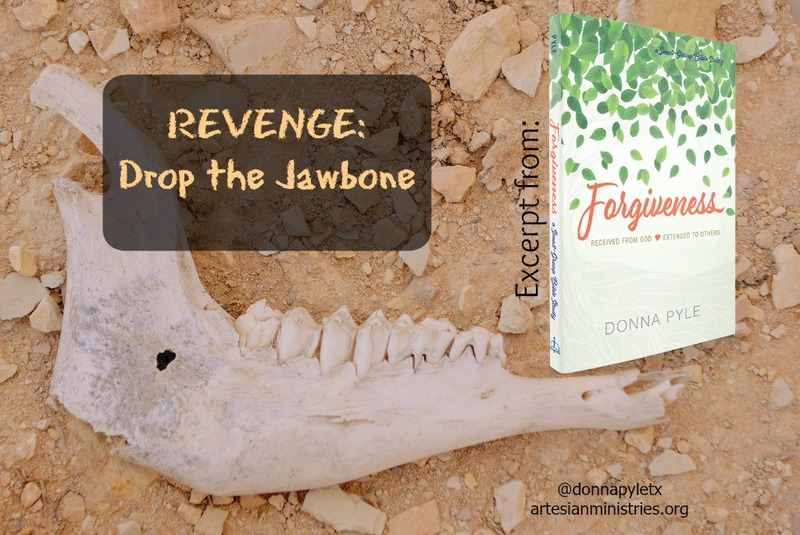 Forgiveness begins when you drop the jawbone. 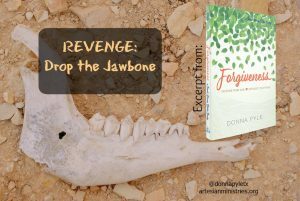 When you find yourself in a situation where there is a nonstop back and forth, decide to put down the jawbone of revenge and back away. Forgiveness starts by refusing to participate in the game and stepping forward to end it. Maybe we need to ask ourselves how much revenge is enough until we feel better? until our anger subsides? The anger we feel from pain makes revenge seem logical. But anger can escalate quickly into rage and even hatred. Anger is an impossible blockade on the road toward forgiveness. That blockade can be removed only when we surrender the underlying pain to God for healing. God takes our pain on Himself, so use God as the lightning rod for your anger. The psalmists did exactly that in Psalms 7; 10; 17; and 28. God alone is our avenger. Remember Job? There are dozens of places in the book where Job unloads his anger, frustration, and wounds onto God, along with a little sarcasm (Job 10:3). God can take all of those emotions and knows best how to handle them. When someone wrongs us, instead of groping for a verbal weapon, reach for the Word of God: “praying at all times in the Spirit, with all prayer and supplication. To that end, keep alert with all perseverance” (Ephesians 6:18). Instead of hitting our enemy, we can hit our knees. We can pray earnestly for God to heal our pain, remove our anger, and work forgiveness in us so we can extend it wholeheartedly to those who hurt us. Instead of feeding our hurt, we can feed our heart. Relentlessly confess, repent, lay your hurt at His Table, and receive His forgiveness that refreshes. God alone is our righter of wrongs. The power or responsibility does not lie with us (Romans 12:19). 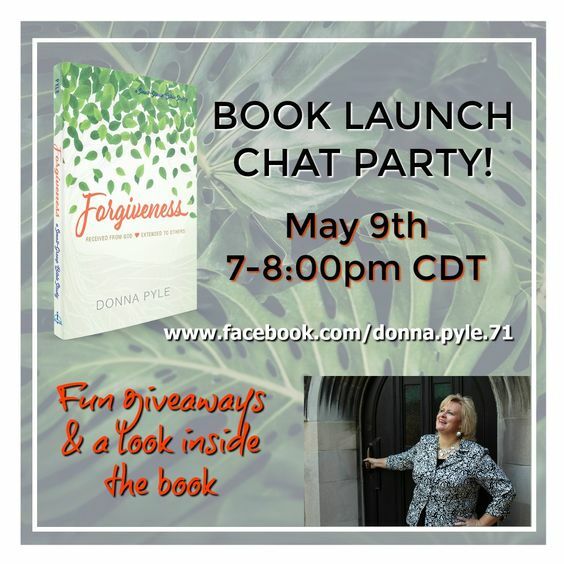 Forgiveness relinquishes all rights to punish our wounders and give them over to Christ. God is a God of justice as much as a God of love. 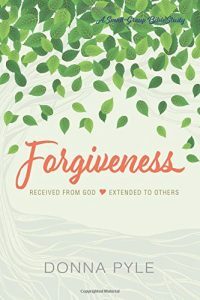 Forgiveness does not mean that our wounders get off the hook; it recognizes that we are not the righteous judge of sin. That authority belongs to Christ alone. Follow Jesus, not the path of revenge. These are the days when our culture seems to embrace rage. But we look around at the brokenness and perhaps we wonder … don’t we all need a whole lot more forgiveness? We turn on the TV or scroll through social media and see drama-filled outrage over things that will be forgotten by dinner. And I can’t help but ask: why are we so angry? What cut our fuse so short that we’re constantly blasted and damaged? Perhaps it’s time that we look each other in the eye and admit we need each other — that forgiveness paves a better way. A holier road. But how do we handle the pain we can’t contain? those memories that track us down like blood hounds on a scent? Maybe what overwhelms us the most is feeling like no one understands. Been there, done that. Hence, this book. Because rage will cage us unless we forgive. 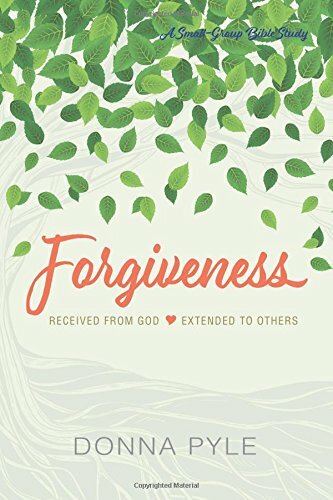 If there’s one thing I’ve come to understand is forgiving is an act of giving: For God so loved — He gave. Forgiving gives life. Forgiveness restores freedom. Not for our offenders. For us. 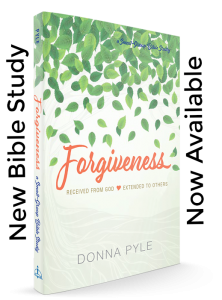 I’ve lived the rage and know that forgiveness has radically transformed my life. When we trust Him, God can turn our anger into outrageous abundance. After struggling and failing, and learning and growing, very slowly, I started to write. Does forgiveness make any sense in a raging world? In a raging heart? And I didn’t even know if writing this made sense, so I reached out to people much wiser than I. They affirmed then, and they affirm now — if the world doesn’t see forgiveness from God’s people and among God’s people, they won’t see it at all. I mean how can people learn if the examples are huddled and trembling behind locked doors like the disciples after Jesus was crucified? The winner will be announced on Tuesday’s regularly-scheduled blog post. I pray that God uses Forgiveness in ways only He can fathom or imagine to transform our raging culture to a forgiving one. It’s such an honor to serve you, friends. Thank you. Join me tonight for a Facebook livestream book launch celebration!